Summary: An amateur film of floral colour in Haringey. Description: The film begins by the clock tower on Crouch End Broadway, moving swiftly on to Hornsey Town Hall and its glorious flower beds. Some shots of Muswell Hill show municipal planting in raised beds on the corner of Fortis Green Road and Muswell Hill Broadway. Some more beds filled with flowers are filmed around the junction of Fortis Green Road and Queen's Avenue. Then it's back to Muswell Hill Broadway with a view of buses waiting in the roundabout, hanging baskets on surrounding lamp posts and a bus conductor counting change whilst sat on a bench surrounded by a flower bed. Some more municipal planting is filmed along Muswell Hill Road, beginning at the bottom by the junction of Park Road and Priory Road and heading back up towards the Broadway. A woman walks off of Muswell Hill and down to benches overlooking the old railway line between Highgate and Alexandra Palace (the track has been removed, but the platforms of Muswell Hill Station remain). Some children are filmed running through the concrete underpass that has replaced the railway tunnel under Muswell Hill. The next shots show parks gardeners in Shepherd's Hill Gardens, using a mower to cut the lawn at the top and dead heading flowers. Some members of the public rest on park benches and enjoy the view over towards Alexandra Palace. More park benches are enjoyed in Midhurst Gardens on Fortis Green Road. Exterior shots of the 'John Baird' public house on Fortis Green Road include views of more flower beds on the corner of Princes Road. Along Park Road, Crouch End views of the row of shops approaching the junction with Lynton Road include street tree planting. Exterior shots of 'The Princess Alexandra' public house on Park Road include views of flower beds on the corner of Palace Road and opposite. The flats at Ramsey Court have their flower filled gardens and balconies filmed also. The front gardens of Springfield Avenue, Muswell Hill are recorded from a moving car and by a roaming pedestrian. A woman and a man are filmed walking past more flower beds on the route into Crouch End Playing Fields off of Park Road, opposite Park Avenue. The film then moves along Park Road taking in the entrance to the North Middlesex Cricket, Lawn Tennis & Bowls Club; and Hornsey Parish Church on the corner of Cranley Gardens. More gardens are filmed in the grounds of apartments at Dale Court, by the forecourt of Palace Motors and outside the open Air Swimming Pool. There a dip in the waters of the pool with views of children enjoying the water slide, paddling pool and diving boards. Then the action moves to The Priory Park, taking in its tea room and formal planting. Along The Campsbourne road, things are a bit grimmer, with boarded up windows in terrace housing, smashed glass, broken fences and decaying brickwork. Some demolition work is filmed in action with men a machines tearing down housing and collecting rubble. New housing comes in the form of flats at Shelley House on Boyton Road, and Elgar House in Boyton Close. The tree lined pavements of Coolhurst Road and Twyford Avenue provide green barriers to the houses. The traffic is much heavier on High Street Hornsey a sit thunders toward Turnpike Lane, but there's some relief in the Garden of Remembrance by the tower of St Mary church. my father was the resident pharmacist at kemp`s pharmacy in princes parade (now 47 the broadway), we lived in the flat above the shop and moved to chislehurst in 1961.
i was born in alexandra park nursing home and still remember some of the scenes from the film as though they were yesterday, great film! Such memories. Born in Rathcoole Avenue in 1936; moved to Canon Road (no longer there) in 1937.The opening shot of the clock tower reminded me that I, and later my two younger brothers, did a paper round starting from Jim Saxon's newsstand opposite. Happy days. Born 1945. Lived in Linzee Road, went to Campsbourne nursery/infant/junior school then on to Stationers. Belonged to the Army Cadets in the Drill Hall. Remember Priory Park, especially when the occasional funfair visited. Swimming Pool was a great place, inc its cafe. Seeing the youngsters scampering around reminds me of what freedom we had to get bruised, grazed, nettle-stung or whatever without adults fussing over us. Saturday morning pictures at the Ritz or the Odeon was enjoyable and in teens for evening films. There was also a glimpse of the entrance porch to The Atheneum dance hall and of our lads' local, The Bird in Hand. What a fabulous film. So many memories and it was lovely to see the places I remember with fondness. Born in 1952 and lived in St Mary’s Road until it was torn down in the 60’s and then in Hawthorn Road. Have watched that film several times and shared it with friends and family who used to live there. We’ve all moved to different places but are still in touch - even some friends from infants and junior schools ! I went to Rokesley Infants, then juniors and then Clemence Cave . Left Hornsey in 1974 when I got married and my mum, dad and brother John moved out in 1981. Have been back on a few occasions for a nostalgic walk about! Fantastic childhood in Hornsey. Have just booked a ticket for a guided tour of Hornsey Town Hall. This was a great find thankyou for sharing. Although I wasn't born until 1960 which was probably the year after this film was shot. but i do remember the area very well as a child, Crouch End Broadway with the Clock Tower, Town Hall, Park Road Swimming Pools with that refreshing Fountain, Hornsey High Street, Went and lived in Hornsey and Muswell Hill in the 60's & 70's sadly moved out in the early 80's due to work commitments and worked at Alexandra Palace for the BBC when they were using the Studio's too make progammes for the Open University so i occasionally pay visits too the area as i have never after all these years lost any effection for any of it & this film holds so many memories of growing up here. Thanks so much once again. In 1947 we moved to 27 Roseberry Gdns, which was the first of a row left standing on the right side due to bombing. My father was a West End hairdresser. The actor Peter Sellers would come every few weeks to have his hair cut at No 27 and stay for tea and a chat. In the early 1960s we moved to Rokesly Avenue. Unfortunately in 1952 Polio Struck affecting my Sister Ann and I. She has been disabled since then, I escaped that. Too many other memories to include here. I live in Palmers Green now. I was pleased to see the remarks from Marilyn Peppett ne Blanche as she was in my class at Campsbourne and my brother was also a friend of her brother. I have always remembered and told a story many times over the years about Marilyn having to do some sewing on a certain part of a teachers clothing called Mr.Goss’ when we were only about 9 or 10 years old. Marilyn please contact me if you wish to be reminded of this event. I have lived in Perth, Western Australia since 1971, l was born in Muswell Hill and lived in Turnpike Lane until I moved to Stroud Green in1950. These images bring back so many memories of Hornsey in the fifties and sixties. In those days you walked everywhere and absorbed every street scene, brilliant!!! Loved watching this film it bought so many memories of my young days being bought up in northview road hornsey and going to campsbourne school nightingale lane, lovely footage of muswell hill too. Amazing, I lived and was born in Priory Avenue opposite Priory Park, those kids in the paddling pool and on the old railway line at the top of Muswell Hill could have been me ! Doctors Who at the bottom of Muswell Hill 2 minutes in was quite a treat! I just love this old footage, I can see that the cameraman was rather keen on flowers! I lived with my family in Queen's Mansions, on the corner of Queen's Avenue and Fortis Green Road, Muswell Hill in the late 50's. There was a sweet shop on the corner. Half expected to see my parents pop up in this wonderful footage! This wonderful film brings back many memories as I lived above the labour party rooms in Middle Lane up to the age of 7 between 1947 - 1954. I still go back now and again to have a walk around the area. Amazing and heartbreaking all at the same time.....my dad will love this. Thank you so so much for sharing. I lived just off colney hatch lane , Muswell hill from June 1940 until August 1957 when I left to get married. I was married in the Methodist church on the corner of Alexandra Park Road. Imagine my dismay when I discovered it was turned into flats! Muswell Hil. Was a lovely place to live in those days, such classy shops such as Summersbys and Becky Fields. I used to have a hay day on Saturdays after I had been paid. So many wonderful memories triggered by seeing this incredible footage from the late '50s/early '60s, I guess? I was brought up in Ramsey Court, moving in as a baby with my parents in 1963. To see it on film from around those times, stirs so many emotions of my parents (now both dead) and our lives there. The Princess Alexandra was owned/managed by Charles and Margaret Young when I was a child. It was my dad's local and he and I walked their wonderful labrador, Prince, for them. We'd take him over to recently closed racecourse at Ally Pally and many other local spots featured in the film. I'd hide behind a tree etc., and he'd refuse to move on until he found me again. In the early '70s, ran out of the pub and was knocked down and killed by a W7 bus. I was devastated at the news, and I have never forgotten him. Too many other recollections to list. An absolute privilege to see this film - something I never thought existed. Grew up in Muswell Hill and went to Tetherdown Primary School and Hornsey High. We lived in Woodland Gardens and Dad paid £800 for number 65 during the war. Those houses are now fetching nearly £2 million. The film brought back many happy memories. My parent and grandparents lived in Crouch End, Hornsey for many year....I joined them at 25 Lynton Road off Park Road when I was born on 5 May 1941. I worked at Palace Motors in Park Road when Jack Flock and his family owned the place, it was great fun working there. I loved both Crouch End and Muswell Hill as they were both wonderul areas prior to Haringey coming into being, Such a wonderful film for which I thank you, happy memories! My mum & dad owned the greengrocers in Broadway parade number 20 P.Jones, i went to school at Rokesly infants, then the new junior school inthe 50s lived in park rd. Swimming pool nearly allthe 6wks. holidays was a great place to live as a kid, also went to crouch end secondary modern only good thing there was metal work trouble was it only lasted my frist year, had some laughs though now live in Rayleigh Essex, trouble is you can't go back any one remember the coffee bar opposite the pool was it the double 7. I went to Rokesly Infants in 1950 and then to Crouch End Junior (demolished in 1975, now a private estate development), my first classroom was in the prefab at the end of Tivoli Road, with a brilliant teacher, Mr Neuberg. Brilliant film. I wonder if anyone knows of what happened to "The Sweet Co-op" made around the same time (prob 1957) by the Hornsey Junior Film Club - about kids who decide to pool their money to make their own sweets faced with the high cost of mass-produced sweets - the film was produced with a grant from the London Cooperative Society but there's no copy in their archives. I went to Rokesley Infants in the mid 1960s, and then Crouch End Junior School (which used to be on the corner of Park Road and Wolseley Road) 1967 - 71. We lived in Tivoli Road from the mid 1960s till 1972, in a house that used to have the dinner huts for Crouch End Juniors right next to it. The house was previously lived in by various members of my family, my nan, aunts and uncles, in the 1950s (and maybe the 40s). The house was purchased from my family by Haringey Council in 1972. I have a few old photos in the street. Not that it matters too much but I think this was mostly filmed in mid-late 1960 as Dentist in the Chair was made/released then and also the park opposite the old ABC cinema wasn't actually opened until 1960. 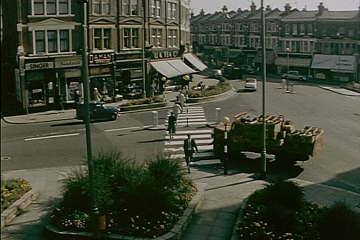 Still, great film but what a shame the cameraman didn't show more of Fortis Green Road, esp. the much-missed Athenaeum , bought and demolished by Sainsbury's! I was born in Muswell Hill 1956 and lived in Mayfield Road N8, right opposite Stationers a School. I went to Rokesley infants and then juniors, finally went to Stationers. Lovely film, grew up in the area and my father was a bus driver at Muswell Hill garage so I have focused on the buses shown. Dad drove on the 212 route which became the W7. I would love to know if a higher resolution version is available and if it was cut as the time sequence and the historical facts do not coincide. Bus route 212 was single deck RFs until Jan 1960 and thereafter was double deck RTs. These appear out of sequence in the film. The majority are double deck with summer flowers which would put the date as 1960 not 1959 for those sequences. Muswell Hill train station operated until 1957 and the tracks and station buildings were removed and the concrete tunnel shown put in place to strengthen Muswell Hill to allow the double deckers by 1959 as the new service started in Jan 1960. Note the comment below about the film advertised at the cinema which also puts a 1960 date on those scenes. What a nostalgia trip! I grew up in Muswell Hill between 1955 and 1975. The film brought back so many memories, especially the open air pool. I worked in Hornsey Library behind the Town Hall, strange to see it again. It is so great to see front gardens, instead of concrete parking places as they are today. We didn't appreciate what a well cared for Borough it was. I was also slightly amused at the number of older ladies in hats making a beeline for the park benches !!!! I remember shopping at the Co-op on the corner of Park Rd with Ration Books, then going to the Clinic near the Town Hall for tins of National Dried Milk and bottles orange juice., paying the Gas and Electricity. Bills at their offices by the Town Hall, queuing for bread at Dunn's and going to Wilsons Department Store for Haberdashery!!... then there was the Paper Man who stood outside Barclays Bank on the corner of Weston Park..... and getting the chimney swept by Firkins in Middle Lane. Happy days . I was born in Boyton Road, Hornsey in 1947. We moved to Muswell Hill in 1952. My first school was Campsbourne School. When I was older we used to go to Durnsford Swimmng Baths. So many memories. This is a great reminder of my very young years. Thank you so much for posting it. This is the most wonderful footage and brought back all sorts of memories. I was born in 1959 and brought up in Highgate, went to school in Crouch End (Highgate Wood) and walked to school down Shepherds Hill every day. My mother did a weekly shop in Muswell Hill and then later I lived in Crouch End for many years. In reply to a previous comment, I think the cinema at the top of Muswell Hill was an ABC. Speaking of which, the film that is advertised outside is called 'Dentist in the Chair' which was released in 1960. Absolutely fascinating to see all the bomb damage around Campsbourne and Park Road as it used to be and the swimming pool - I could reminisce for hours but I'll stop now. Thank you for sharing this film with us all. I grew up in Muswell Hill during the 60’s & 70’s going to Tetterdown School & Hornsey School for Girls in Crouchend. I remember great times had at Park Road Pool, Saturday morning pictures at The Odeon Muswell Hill, Brownies & Girl Guides at The United Reform Church and using Red Rover tickets on the old Route Master Buses. Very enjoyable. I lived in Muswell Hill in the 1950s and 60s. Great seeing the familiar places, the people, the cars, the shops. Brings back a lot of memories. Enjoyed it thoroughly. I found an old map of the Hornsey borough which identified all the WW2 bomb hits and which type of bomb too. The Priory park paddling pool was a direct result of a V2 rocket ! My own block in Middle Lane N8 was built on a V1 hit. Watching the film while glancing at the bomb map helped identify why some blocks appear as there do in Crouch End. Hornsey was targeted during the war because of its railway junctions amongst other things. Campsbourne Estate was constructed over a part of Hornsey that was flattened by the Luftwaffe, this is very clear looking at the film of that area. Much of London remained untouched for years because the cost of clearing and rebuilding and by 1959 (the time of filming) the urban revival was in full swing as shown by some of the new buildings next to old craters. Fantastic walk back through local history. Great to see So many flowers/beds and shrubs. Hornsey was a borough that took pride in its gardens. So many of these sites have disappeared now or the remains are not planted and left to rubbish etc. There's no civic pride anymore in keeping up these lovely green places, or probably no money for luxuries like this!. Thoroughly enjoyed watching all the parts of Hornsey I grew up in and still live around the area. I remember the cinema at the top of Muswell Hill (What was is called? The Ritz?). The first film I remember seeing there was Chitty Chitty Bang Bang in the early seventies. Films back then were released several times in the years following their first release, so it probably wasn't its first outing. My Dad took me. I saw all of the Pink Panther films there through the seventies (Still a huge Peters Sellers fan). The Police Box (Tardis type) filmed at the foot of Muswell Hill is brilliant. I'm surprised BBC Worldwide haven't slapped a breach of copyright order on the films distributors. This brought back some lovely memories. I lived in Hornsey, just up Tottenham Lane, in Nelson Road. I went to school at Rokeskey Infant and Junior schools and the up to Muswell Hill to Creighton School. Great times. Brought back many happy memories having lived in 'The Campsbourne' Boyton road in the 1940's before moving to Muswell Hill in the 1950's. Knew and visited most of the locations. Have sent links to friends and family as well as posting it on Harringay History where Campsbourne is currently being discussed by ex residents. Great archive, continue the invaluable work of preserving our history. More should be on line. Fascinating to watch the footage of the place I've lived for the past thirty years. There's a real sense of pride in making the neighbourhoods around Hornsey attractive. Some of those young trees are quite mature now, but you don't often see massed dahlias! A born and bred Crouch Ender, my parents moved into the area over 40 years ago, and we have some friends still alive that may even appear in the film! Wonderful! Thanks for putting this on! Totally amazing footage. I was born in the houses that were being demolished and we then lived at 7 Elgar flats, right at the time this film was shot. I cannot be absolutely certain, but I do believe that is my Dads van outside the flats.